Looking to buy a 6×6 medium format camera and can’t decide between a Kiev 88 vs Hasselblad? I had the same decision but now own both. Here I share the pros and cons of each camera for me. 1. My Kiev 88 (ARAX-CM) Love this camera!! One of the first film cameras I bought was a 6×6 medium format rebadged Kiev 88 camera called an ‘ARAX-CM’. The Kiev 88 was a clone of the 1600 F Hasselblad model hence the nick name Hasselbladski, made in the Arsenal factory in Ukraine. At the time I also had a more modern Contax 645 film camera but I didn’t like how automated it was despite the amazing and famous Zeiss Planar 80mm f2 lens. I would say the Contax 645 is the camera of choice for many pro wedding photographers that shoot film but somehow I preferred the old fashioned Kiev 88 experience. So much more rewarding! 2. Kiev 88 – A Proper Camera! For me the Kiev 88 is a real film camera. All mechanical, no batteries and manual everything. I also like how compact it is for a medium format camera when using the waist level viewfinder. My crazy plan at the time was to shoot weddings with two Kiev 88 cameras so I bought an original Kiev 88 camera and additional film backs for both the Kiev 88 and ARAX-CM camera bodies. I then bought extension tubes for macro and an array of lenses the fit the cameras. The ARAX-CM has a P6 (Pentacon 6)(accepts lenses from my 6×6 Pentacon 6 TL camera) lens mount whereas Kiev 88 accepted screw mount lenses. With a small Chinese adapter from eBay I could use the screw mount lenses on the ARAX-CM which was my main camera body to use. I then had the second Kiev 88 camera (with chrome finish like the old Hasselblads!) as more of a film camera backup body. Kiev 88 lenses I had included Mir 26B 45mm f3.5, Mir 38B 65mm f3.5, ARAX 80mm f2.8, Vega 28B 120mm f2.8 and the mighty Carl Zeiss Jena Sonnar 180mm f2.8 lens. My lens of choice was the Mir 65mm f3.5 that let me focus close to give a nice shallow DOF. This lens lived on my ARAX-CM! 5. I took the camera everywhere, even India! My ARAX-CM camera travelled with me everywhere in addition to a Nikon DSLR digital camera at the time. Because of the compact size of the Kiev 88 design I took it on trips to Poland, Hungary, Ukraine, Russia, and even India. The ARAX-CM was my film camera setup for everything for maybe 12 months and then I bought a 35mm Nikon FM SLR camera. After this time my film photography stepped up a gear and I started buying more film cameras. I bought a Mamiya RZ67 Pro II 6×7 camera with 4 Mamiya Sekor lenses 65mm, 90mm 110mm and 180mm. The RZ67 waist level viewfinder is big and bright and so easy to focus with. The Mamiya Sekor lenses also brought a new level of film image sharpness that I had not yet seen. I bought 645, 6×6, 6×7 and Polaroid Mamiya RZ film backs and together the Mamiya kit put an end to me using my ARAX-CM and Kiev 88 cameras. The RZ67 was a bigger camera but I loved the Mamiya bellow lens focusing system to get in extra close without the need for extension tubes. I sold the Kiev 88 camera but kept my ARAX-CM. The ARAX has sat quietly on the shelf as my photography pushed forward at a fast pace year on year. I moved from Nikon digital cameras to a Leica system and my appetite for perfection continued to grow. My latest purchase was a Hasselblad 501C camera. More similar in results to the Mamiya RZ67 Pro II (when using a 6×6 film back) and also with regards to being more precision/ professional feeling. It was a few years (or more) since I had used my rebadged Kiev 88 so decided to dust off the ARAX-CM to re-live the experience before the Hasselblad arrived. I love the fact that the Kiev 88 lenses can focus much closer than Hasselblad mount lenses and that the ARAX-CM has a built in hotshoe for strobist photography. Hasselblad vs Kiev 88 – I used the ARAX-CM on a model shoot and I was amazed how difficult it was to focus the dim split screen centre spot with the WLF. I think got so used to the Mamiya RZ67 and later the Mamiya 645 Super WLF that I have been spoilt. 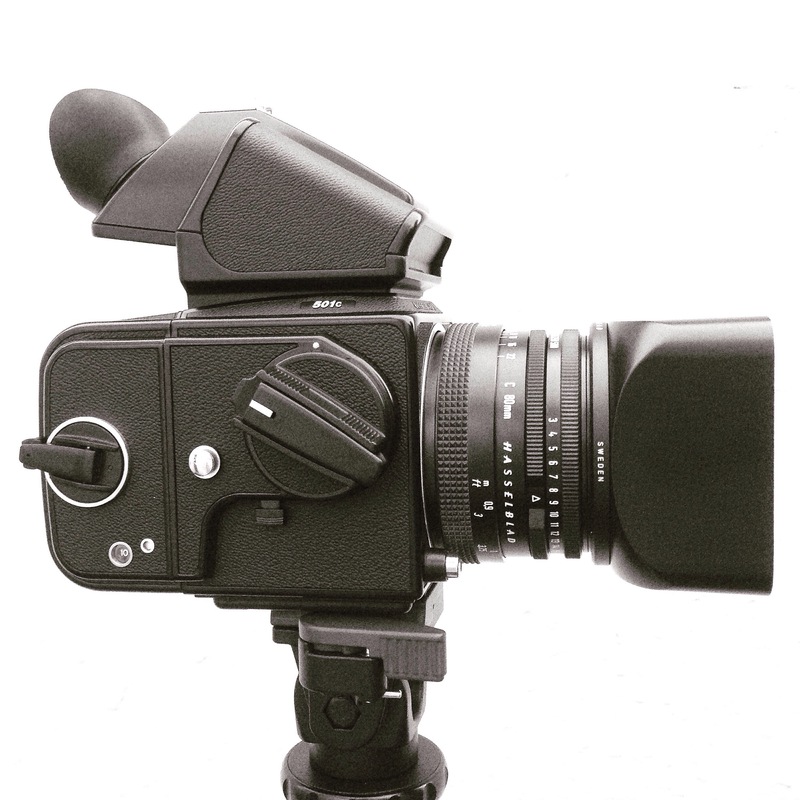 I will now sell the ARAX-CM as the new Hasselblad will perform a similar role. I didn’t have any expectations for my Hasselblad camera as I have never tried one before buying. I expected the 501C to be pretty similar to the Kiev 88 in many ways but I was so wrong! 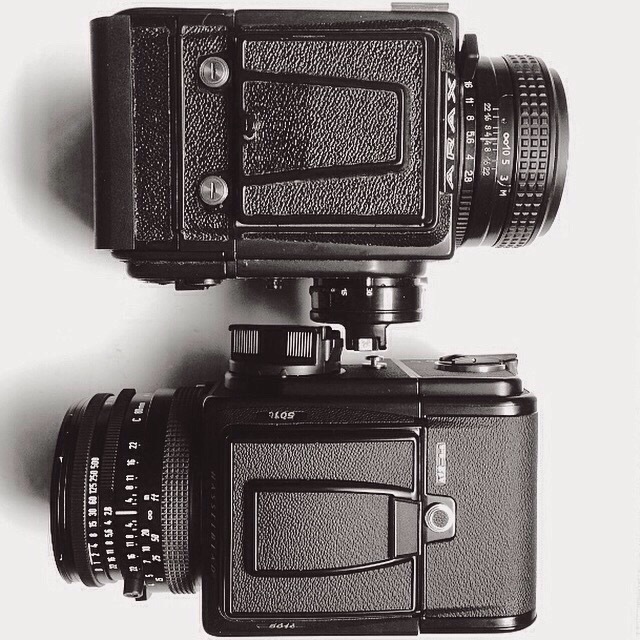 Yes the do look very similar and yes they are both 6×6 medium format film cameras but that is all. The Hasselblad accepts Zeiss lenses with built in leaf shutters that sync at 1/500 vs the focal plane shutter in the Kiev 88 camera body that syncs at 1/30. The build quality of the Hasselblad feels on par with Leica camera if not better and feels like a Swiss made watch. A true precision instrument. The Hasselblad film back is indeed similar to the Kiev 88 back but just feels better made. The ARAX-CM film back was a different design but looked similar from the outside. The Hasselblad Zeiss leaf shutter lenses add both weight and cost to the equation. Lens for the Kiev 88 can be picked up on eBay for as little as £75-£100 each. Zeiss lenses for the Hasselblad however are normally £350-£800 and skywards. I think if you are a photographer that only dabbles in film a few times a year then a Kiev 88 will provide the medium format film experience on a low budget. If however you need a precision tool to get the best possible images while enjoying every moment of the experience then I recommend getting a Hasselblad. I think the Hasselblad together with my Leica M3 film cameras are cameras for life. Could I tell the difference between a photo taken with a Hasselblad vs Kiev 88? I think no. Both camera systems can capture sharp images and I think the choice of film used has an equal part to play in the final results. I don’t remember the Kiev 88 ever giving me soft images as such I but just notice that Hasselblad images can look almost unforgivingly sharp when stopped down. 15. What is the perfect camera? For me a camera can create the perfect photo but unless I enjoy the process of making it then it is of no real interest. An obvious example of the is the super sharp Fuji GF670 folding rangefinder camera. Great photos but no emotionally attachment. The Hasselblad somehow makes it fun to take photos of the most simple everyday objects to try to create ‘art’! The Hasselblad 501C camera has secured itself a place in my wedding photography camera bag together with my Leica M3 and digital Leica M 240. It would be like leaving one of the children behind otherwise! I have a love-hate relationship with my Hasselblad. I love it as a mechanical marvel but hate using it as it is such a clunky experience. It is loud and far from intuitive. The need to make sure the body is in the correct state to change lenses or backs is so confusing at times. Last weekend I took mine out for the first time in ages with two lenses and two backs. I ended up bringing all the parts back home after a couple of pictures, having bricked the lot. Of course it was user error and sorted it out later by re-cocking the shutters on the lenses so they mounted again. Great camera but not for the casual user. I can’t imagine how awful a Russian one would be. I really don’t understand why you detest the Contax 645 as you know. It is fabulous with the best of all lenses. No quirks, though perhaps if quirks are what you want then perhaps that’s its weakness. Thanks Jezza. Sorry I could not reply via my phone and was away. Yes I have ahd to read up quick on recocking shutter etc etc with using lenses, backs, tubes so I hear you. I think maybe I like to be more involved in that way but as you say in the moment you can mess up if not thinking. Yes I still believe the Contax is great and I my Nikon F4 is a mid ground in terms of speed of use and automated. I do love the f4 so I can’t promise I wont have another Contax in the future depending on what my demands are. Great post. I’ve been looking for opinions on Kiev-88 vs Arax vs rb/rz67 vs Hasselblad 50x and your article provided me with the much needed insight. As a hobbyist, shooting only during weekends, I’m using a Kiev-88 and looking to step up my gear. I don’t think my budget is ready to justify purchasing a Hasselblad and am currently on the fence between Mamiya and Arax. Thanks to your description, I think I’m a little closer to deciding in favor of Mamiya for the sharpness, bright viewfinder and bellows. Both offer MLU, so no competition there.